As children of God, we are to “….proclaim His salvation day after day. Declare His glory among the nations, His marvelous deeds among all peoples.” (1 Chronicles 16:23-24) We are also directed as in the parable of the good Samaritan, to offer aid, comfort, and encouragement to this hurting world. 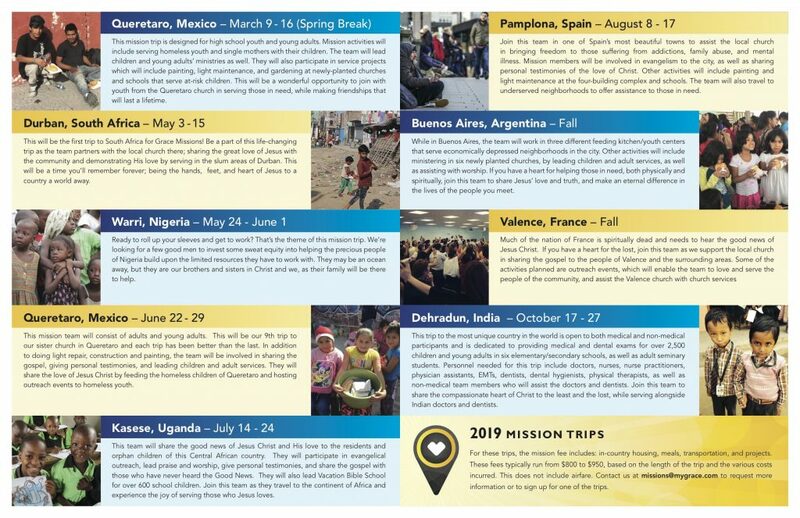 The Grace Missions department was created to do both as we take mission teams all over the world in support of Grace International missionaries. We encourage you to pray about which trip God might be leading you to take. For more information, contact us at missions@mygrace.com.